It's so frustrating. Sometimes on older style doorknobs, you reach out to turn the doorknob expecting the door to open and all you get is a spinning doorknob in your hand. So you go ahead and tighten the doorknob set screw and a week later the same problem occurs! The problem is that the set screw loosened up and is not applying enough pressure against the threaded spindle. This happens as doorknobs age from use. Screws loosen and doorknobs go wonky. Newer style doorknobs may not have set screws but can still loosen. In this tutorial, I'll show you an easy way to fix this problem once and for all. 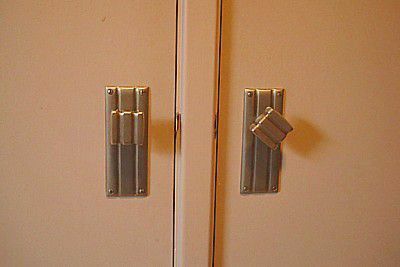 All it takes a special blue compound called a thread-locker and you'll be "wonky" doorknob free. Unlike door knobs with hidden screws, older style doorknobs have visible set screws. Removing the doorknob is easy. Simply loosen the one or two set screws that hold it onto the spindle and then unscrew the knob from the spindle. Once the doorknob is removed take it to a clean work area. Carefully remove the set screw(s) and set them aside. The secret to this tutorial is the use of a thread-locker. There are a few brands out there that are readily available such as Loctite® or Permatex®. For this tutorial, we will use Permatex brand thread-locker. Permatex packaging is horribly confusing because the permanent thread-locker (red) comes in the same blue color packaging as that the removable thread-locker (blue). Do not buy the red thread-locker! Red thread-locker is permanent and requires 450 degrees F of heat to remove! Make sure you buy the medium strength blue thread-locker which removes with hand tools. The thread-locker works without air and cures between engaged screw threads to form a one-piece assembly that, well, "locks" together. To apply the thread-locker, first shake it well. Apply somewhat sparingly to the threads and try not to allow the plastic tip of the bottle to touch the screw surface during application. Once the set screws have the thread-locker on them start them into the screw hole of the doorknob stem. Just get the screws started enough to hold them in place, about a turn or two. Next, install the doorknob. Make sure to note and match the orientation of the spindle's flat surfaces with the location and orientation of the doorknob set screws. As you screw the doorknob onto the spindle, be sure to stop screwing the doorknob on when the doorknob set screw(s) are in the proper orientation. You'll want the doorknob fully on but do not over tighten! Fully seat the set screws so they bear fully on the flat face of the spindle. The completed doorknob installation will be rock solid and look great. It will also not come loose again, and you can rely upon proper operation for years. Good job!